Hello everyone! Here Alex He, again, Producer on Spirit Guardian-Vanguard Rush here at GTArcade. This is the second time that I am writing to you all and I am even more thrilled than the first time to release the upcoming Version 1.6 update for SG-Vanguard Rush. The whole team and I pay much attention to what you want to update in the new version and now I am happy to announce that some of your proposals have given us so much insight and they are realized in this upcoming version. And I am so honored to share what’s coming in this new update with you. The Development Team’s primary goal for this year has always been to deliver quality game updates that cater to all aspects of the needs from our dear players. 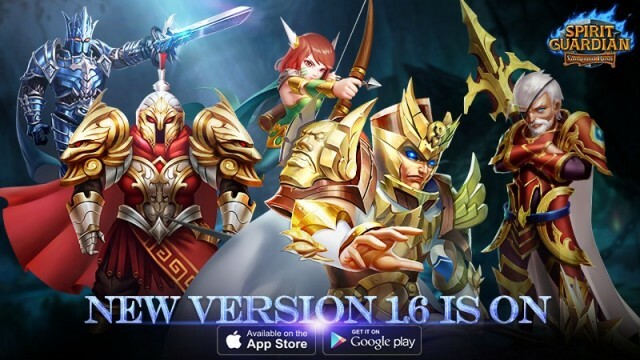 As to achieve that goal, we have developed more cooler features to unlock in Version 1.6: 【Championship】 【Guild War】 and【Friend PK】. *New Feature【Guild War】: Hundreds of guilds emerge and start the continuous disputes, thousands of powerful heroes are summoned to fight for glory. As one of the core gameplays in SG, guild war the competition of team strategy and strength, guild members need to take control of the overall situation and take use of reasonable countermeasures thus to guarantee the victory of fight and become the Champion of Guild. *New Feature【Friend PK】: The adding of Friend PK gameplay will present your full-scale strength, the PK between friends is interactive with fun which makes dream raiders recall the memories of competing with fellows. *New Feature【Championship】: Championship witnesses the ubiquitous pairwise fight, dream raiders manage to observe the rules of survival of the fittest and strive for the Champion Glory. Spirit Guardian is always popular for its diversity of heroes. In Version 1.6, new heroes are indispensable for the update. There will be a rock star named Sam who is created based on the prototype of one of our producers of Spirit Guardian. Sam will carry stunning instrument as his equipment fighting for dream raiders. The other heroes Alpha-Prime, Omega-tron, Emperor, Apollo, Blackfeather and Chantress will enlarge the Four Leagues and join the Tide of Fighting for Honor. Version 1.6 will extend more super-awesome events including Treasure Trove, Ghost Agent’s Armory, Gate of Babylon and Affinity Dreams, etc. All these events will bring much more fantasies and fun for dream raiders. So don’t hesitate to join your partners in the Dreamland. The best way to keep up with the latest news from Spirit Guardian is to follow our fanpage on Facebook and visit our official site http://www.gtarcade.com/. Through these channels we announce official news, launch new events, and provide game strategies. The Spirit Guardian Team is focused and determined to give you an unparalleled gaming experience. Again, thank you for your support and we wish you a happy journey in Spirit Guardian.